When my local bar, Solid State, challenged patrons to make a movie about their one non-movie-themed pinball machine, Mousin’ Around, I took the chance to get inspired and make a little 5-minute short to screen. It was a blast to make, taught me a little about stop-motion and putting together a film, only took two nights and an iPhone (plus VO from my friend Laura Iris Hill and a tripod loan from TyRaNt ReX), and it won me $50 in credit to the bar. I can now call myself an award-winning film-maker, right? It makes more sense if you’ve played Mousin’ Around pinball, but even if you haven’t, I hope you enjoy. 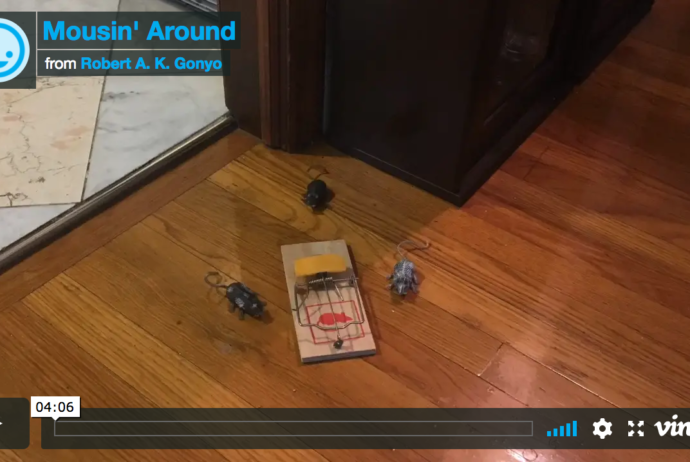 Mousin’ Around from Robert A. K. Gonyo on Vimeo.